Discover the secret to love your job and love the life that you live! Is your high level of capability actually taking you off course? Or is it hindering your career? Become more fulfilled in your career by breaking "The Curse of Capability". 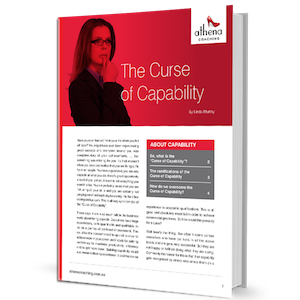 If you have a good role, have opportunity ahead of you but you still feel like something is missing, you could be the victim of “The Curse of Capability”. If you lack direction, aren’t in love with your job or feel like your career isn’t heading in the right direction you want it to … then “The Curse of Capability” whitepaper was written especially for you! It’s filled with all the information you need to know to break the curse and is available as an instant download when you enter your details. How to stop living a life for other people and start doing more of the things and jobs you love doing. To claim your copy of “The Curse of Capability” and enjoy a life-changing approach to your career and personal growth, all you need to do is enter your details below (so I know who I’m sending it to and where to send it to), then click the “Send Me My Whitepaper” button. Simple!